Haryana Chief Minister Om Prakash Chautala today announced the reduction in fee of Voluntary Disclosure Extension in load from Rs 2000 per horse power to Rs 100 per HP making it easier for farmers to increase their load of agriculture tubewell connections at a less cost. Around two dozen of dhabas on the Ambala-Jagadhri national highway between Thana Chappar and Mulana were demolished in a day-long drive by the construction division of the National Highway Authority today. The second conference of the Punjab National Bank Workers Union was held here today under the presidentship of Mr D.P. Tank. It was inaugurated by the general secretary of the All-India PNB Workers Federation, Mr J.K. Sawhney. Deputy Commissioner of Sirsa D. Suresh left for Stockholm yesterday to make a presentation of his project he implemented in Sirsa in October, 2000. This presentation will be made in the final round of the Stockholm Challenge Award to be given for e-governance initiative. One of the five critically injured persons, who met with an accident at Kurukshetra today, died at the PGI. The condition of the other four persons, who were brought to the PGI, continues to be critical. Eighteen terrorist camps in Pak-occupied Kashmir and eight in Pakistan are imparting extensive training to the terrorists in modern weaponry to spread terror in Jammu and Kashmir and other parts of India. Haryana Tourism has started muglai food service at Yadavindra Garden, Pinjore. A rooftop restaurant has been earmarked for this purpose on the terrace of Rang Mahal. Special sitting arrangement has been made to give it a real Muglai touch. Keeping in view the heavy arrivals of paddy and to save farmers from harassment, the Haryana Government has decided to operate mandis on Saturday, Sundays and other gazetted holidays. Inaugurating a 132kv substation in Mundia Khera village in Mahendragarh district, Mr Chautala also announced that based on a special girdawari (revenue survey) the surcharge and interest on the bills of tubewell connections belonging to farmers who had suffered from drought would be waived. Around two dozen of dhabas on the Ambala-Jagadhri national highway between Thana Chappar and Mulana were demolished in a day-long drive by the construction division of the National Highway Authority today. 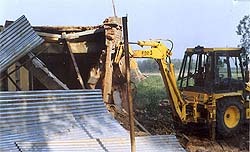 The officials used bulldozers to dismantle the dhabas located within the 100 feet from the edge of the road. The SDM, Ambala, Mr Mukesh Ahuja, was accompanied by several officers of the PWD in the demolishing squad. Later Mr Ahuja said that the dhaba owners had been issued notices by the authority to remove unauthorised constructions within a month, but they did not take care of it. He added that in the second phase of the drive the shops constructed violating the highway rule would be demolished. He, however, said that the shops constructed before the implementation of the national highway road schedule would be exempted. Meanwhile, some of the dhabas owners, whose constructions were demolished, have started running their business in tents at the same spot. 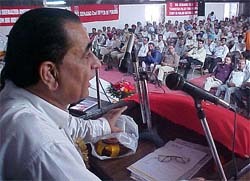 The second conference of the Punjab National Bank Workers Union was held here today under the presidentship of Mr D.P. Tank. It was inaugurated by the general secretary of the All-India PNB Workers Federation, Mr J.K. Sawhney. In his inaugural address, Mr Sawhney criticised the economic policies of the Centre. He stressed the need for a law on the recovery of bad debts from big industrial houses and defaulters. He observed that due to disinvestment policy, the economic condition of the country is going from bad to worse. He criticised the personnel department of the PNB for poor service conditions of the staff. He demanded that there should be a second offer for bank employees and their pension should be paid by the Central Government. He also demanded for making appointments in the banking industry on compassionate grounds. Mr J.N. Kapoor, general secretary, All-India Bank Staff Association, spoke about the charter of demands submitted to the Indian Banks Association on the 8th bipartite settlement. He criticised the role of the AIBEA for the controversial clauses of the 7th bipartite settlement mainly on computerisation and redeployment of staff. Due to the clause of redeployment of staff, various banks were sending their personnel to far-off places, he said. The election of the union were also held in which the following office-bearers have been elected: president, Mr D.P. Tank; vice-president — Mr M.S. Thakur; general secretary — Mr N.K. Tehri; secretary — Mr Chander Shekhar; and treasurer — Mr S.P. Singh. Before leaving for Sweden, Mr Suresh told The Tribune that the District Rural Development Agency (DRDA), Sirsa, had been nominated for the prestigious award for its initiative taken in e-governance and redress of public grievances through IT. He informed that 15 agencies/institutions from different countries including two from India, had been nominated from among the 800 applicants. He said the DRDA, Sirsa, had been nominated for its ‘Soochna Aapke Dwar’ project, which was inaugurated by the Chief Minister. Under this project 32 information kiosks have been set up at various places in the district in addition to the six DRDA complex training centres. The kiosks are providing services like redress of public grievances, issue of licences, domicile certificates, filing of applications and providing information regarding the ‘Sarkar Aapke Dwar’ project. One of the five critically injured persons, who met with an accident at Kurukshetra today, died at the PGI. The condition of the other four persons, who were brought to the PGI, continues to be critical. The Tata Sumo (HR-52A-0019) in which they were travelling had a head-on collision with a canter (HR-55-5333) at Kurukshetra. KURUKSHETRA: The injured are Satpal (36), Ashok Rathore, Jaipal, Tara Chand, Ms Krishna, Balbir Singh, Ram Sarup and Sunil Kumar, driver of the Tata Sumo. The first five have been admitted to the PGI in Chandigarh. Six-year-old Amit escaped unhurt. They were going to Mansa Devi near Chandigarh when the accident occurred. Mr N.K. Sharma, president of the Pak-Occupied Kashmir Liberation Front while talking to newsmen here today, said youths in the age group of 18-25 were being trained and prepared for suicide squads. He stated that Pakistan-based outfits Jaish-e-Mohammed, Lashkar-e-Toiba, Hizbul Mujahideen, JKLF and United Jehad Council and ISI were supporting them with arms and ammunition, rockets and other devices. The inaugural dinner at the restaurant was held last night. The main attraction were the ghazals by Mukesh Dewan, which took the audience in its thoughts into the Mughal era. Soft and silky voice of Dewan kept the audience spellbound. Chairman and Managing Director Navraj Sandhu of the Haryana Tourism Corporation was also present. Mrs Sandhu said the service of Mughlai food had been restricted to Saturdays and Sundays only. Keeping in view the heavy arrivals of paddy and to save farmers from harassment, the Haryana Government has decided to operate mandis on Saturday, Sundays and other gazetted holidays. This was stated by the Deputy Commissioner, Kurukshetra, Mr Abhilkash Likhi here on Sunday. He said the circular of Haryana Government had been released to all officers concerned.